While silver investors continue to be discouraged about the low price, the market has experienced a fundamental change that needs to be understood. Ever since governments removed silver from official coinage, over 50 years ago, the market has been supplemented by several billion ounces of silver. The majority of that supply has been depleted. The reason the United States and other countries stopped producing official silver coinage wasn’t due to any monetary conspiracy; rather it was based on a straightforward problem; supply versus demand. Because industrial silver consumption had skyrocketed after World War 2, the silver market would have suffered deficits if the U.S. Treasury didn’t sell silver into the market. It was quite simple; there just wasn’t enough silver to go around. So, governments started to reduce, then eliminate silver from their coinage in the 1960’s. A lot of this silver, known as “junk silver,” was either purchased by investors or remelted and sold back as supply into the market. While there is no way of knowing how much of the older official junk silver remains in the market, the majority of it was recycled for much-needed supply. 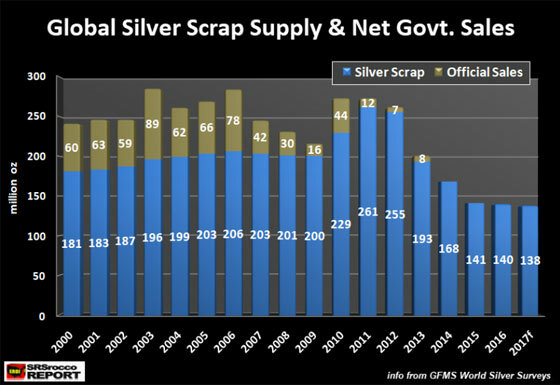 The BLUE bars represent silver scrap supply, and the OLIVE colored bars show the amount of net government silver sales. From 2000 to 2013, governments sold 636 million oz (Moz) of silver into the market. Net government sales were from stockpiled silver and older official coins. However, in 2014, this supply totally dried up. For the past four years, there haven’t been any government silver sales. Another interesting aspect of this chart is the declining amount of silver scrap supply. Even though the price of silver during the 2015-2017 period was much higher than from 2000-2007, scrap supply is considerably less. For example, the price of silver in 2000 was $4.95 while global scrap supply was 181 Moz. However, the silver price has been three times higher (2015-2017), but the average scrap supply has been 140 Moz. Moreover, total supply from net government sales and recycled scrap in 2000 was 241 Moz… more than 100 Moz than during 2015-2017. This is a significant fundamental change in the silver market. The demonetization of silver by governments, especially the U.S. Treasury was a necessary step to meet the insatiable global fabrication demand. Unfortunately, the negative side-effect of this official policy decision was the elimination of silver as money or store of value to function only as a mere commodity.... its valued based on its cost of production and supply and demand factors. In 2007, total Official Silver Coin sales only totaled 45 Moz, but this number surged to 135 Moz in 2015. 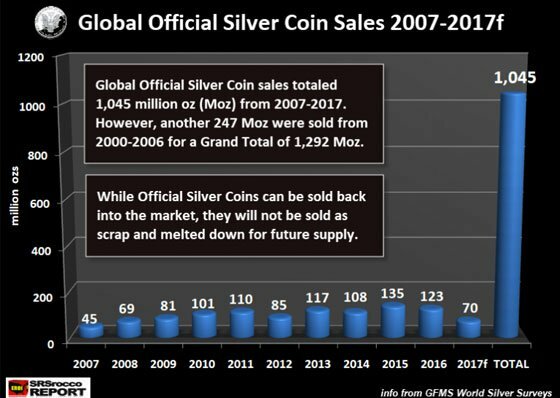 From 2007 to 2017f (f = forecast), Official Silver Coin sales totaled 1,045 Moz (1+ billion oz). If we include the official coins sold since 2000, the grand total is nearly 1.3 billion oz. Now, what is important to understand about the 1.3 billion oz of Official Silver Coin sales is that this investor inventory will likely never be recycled as scrap to supply the market. Furthermore, the majority of the 1-100 oz silver bricks for sale will never be recycled as scrap either. While it is true that both official silver coins and bars will be sold back into the market, they will be repurchased by other retail investors. Thus, the majority of silver investment inventory is LOCKED OUT as a future source of supply for the global fabrication demand. According to the Metals Focus 2015 Report on The Silver Scrap Market, only 3.5% of total scrap supplies in 2015 were from recycled coins. And, the majority of that scrap coin supply came from older unsold European official silver coins and blanks. Of the total supply of silver scrap in 2015, 55% was from recycled industrial scrap, 17% from Silverware, 14% from Photography and 10.5% from Jewelry. What is quite interesting is that most silver jewelry isn’t recycled. The low price of silver jewelry doesn’t motivate holders to take it down to the pawn shop for cash. For example, only 8% of total silver jewelry demand in 2015 was recycled. However, industrial silver recycling amounted to 18% of total industrial silver consumption in 2015. If we include recycled silver from photographic usage, the total amount increases to 20%. In conclusion, the investor has removed a certain amount of silver from the market. A large percentage (95-97%) will likely never be recycled and used as a future supply for global silver fabrication demand. Thus, any increase in global silver fabrication in the future will be met by stagnating or falling supply as world mine production continues to decrease while scrap supply remains subdued. Since 2007, the silver market has experienced a profound change. Investors concerned with the increasing amount of debt and leverage in the system have decided to acquire physical silver investment. While demand for silver bar and coin declined this year, it is still much higher than what it was before the 2007 U.S. Housing and Banking Crisis. Lastly, the reason to own investment silver hasn’t changed even though the low price isn’t reflective of the massive amount debt and money printing issued by the Fed and central banks over the past decade. Yes, it’s true that STOCKS, BONDS, REAL ESTATE & BITCOIN are where the masses have flocked to currently, but their highly inflated values are a temporary phenomenon.